we are glad to welcome you to a very special weekend. yes, every weekend is special and unique in its own right because you were counted worthy to partake in it! So many others actually wished to see today but were not opportuned to do so. As we give thanks, we also want to stay fit both mentally and physically. It is for the sake of your mental fitness that we are here. 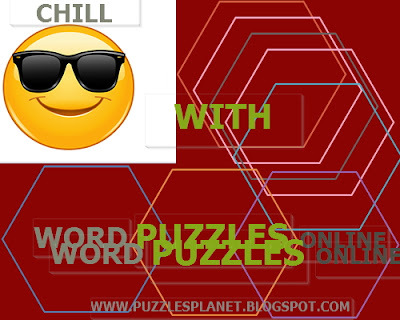 let us have fun with today's brain training exercise word puzzles. I GUESS THAT WAS PRETTY EASY FOR YOUR MENTAL PROCESSOR TO DEVOUR....ENSURE TO SHARE THE FUN BY USING THE SOCIAL SHARE BUTTONS BELOW:FACEBOOK TWITTER,GOOGLE+,WHATSAPP,ETC......HAVE FUN!